Costume Gallery: Dave Matthews Band Video "Stay"
What do you do when your teenagers have a half a day of school??? Well, if your teenagers love Dave Matthews Band (like mine) and they are filming a video of the band locally… you pack the van and go to it! I thought it would be boring and I patiently sat on the sidewalk, trying to figure out ways for my kids to meet the band. My oldest son, Daniel never meets a stranger. So I watched the crew and pointed out potential contacts to get his foot in the door. Suddenly Daniel saw Dave walking to the set and Daniel moved in. Daniel talked with Dave as my shy son, Andrew tagged along. They hung around with the band all day. Suddenly, the costumes worn by the extras started looking interesting…a costuming moment. This would be something that my Costume Gallery readers would enjoy. I quickly jumped into my van and went to purchase a camera. 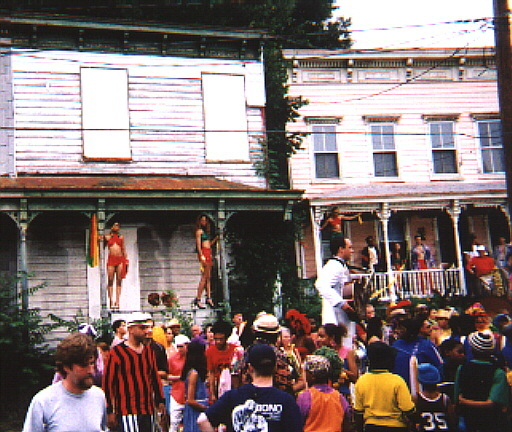 The video setting is a block party resembling a Caribbean town or masqurade/carnival. The costumes had a 1970's flare with bright colors and bold prints. 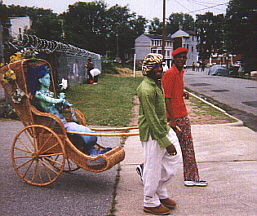 Some extras wore fantasy costumes that bordered on carnival wear. The costume designer is Franck Chevalier (very French) out of New York City. In the photo on the right, Franck is the man with the sunglasses on his head. 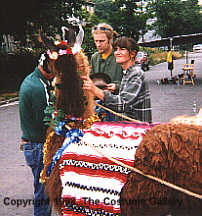 Yes, costuming the animals was part of the job. Some of the extras were hired professionals with their own costumes. The belly dancer on the left was a hired professional. The other hired professionals were a fire eater and a juggler. I have to give credit to Franck for cleverly developing costumes from small pieces of yardage. 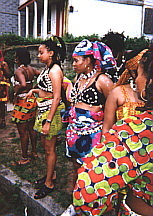 The dance troupe (left) are wearing bras or bikini tops with seashells sewn in various patterns. The yardage wrapped around their heads and hips had very loud and colorful prints. 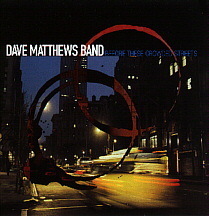 When you see the dancers in the video, they are behind Dave Matthews dancing in a group. The picture to the right shows the designer's imagination. Franck deserves the "Create a Costume with Two Yards of Fabric" award. In the video, these are the dancers you will see on the porch rails. They are wearing 4" heels while dancing on a porch-rail about 3" in width. Truly an amazing feat (or maybe feet). This feathered mask was my favorite costume (left). The extra is waiting patiently while the makeup artist is applying gold makeup to her face. 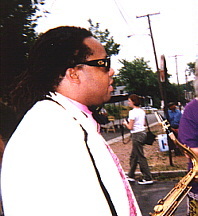 Leroi Moore (right) is the saxophone player for the band. An interesting story behind the bands white tuxes. The black satin trim is actually black electrical tape. Looks real until you are about three feet from the costumes. Are the costumes Caribbean or 1970's? If the extras were not dressed in a special costume, they were 1970-ish. Many of the extras came in their own attire. The mermaid prop (right) was wonderfully decorated. 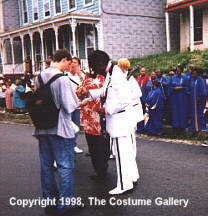 The colorful extras and the Dave Matthews Band costumes of white tuxes made an interesting contrast. I guess you Dave Matthews fans noticed that I didn't get a picture of the drummer, Carter Beauford. He is camera shy. But I did get to talk with him and my son did get to jam with him, so here is our conversation/interview. Just remember this is coming from a Mom (four drummers) and a drummer's wife. Penny: Did you play drums in high school band? Carter: I did not play in band until I went to college. Penny: What is your degree in? Carter: History. I taught History in high school for eight years. Penny: Did your Mother get sick of you practicing drums like I do when my son practices? Carter: YES!!! (Laughing, as he said this). Note…the dancers on the porch-rails. Dave is in the white jacket to the right. The Costume Gallery's Costume Headline News would like to thank the Dave Matthews Band and their production company for allowing us to photograph the "Stay" video filming. All contents of this website are copyrighted by The Costume Gallery, 1998-2002. Reproduction is prohibited without express written consent from The Costume Gallery.